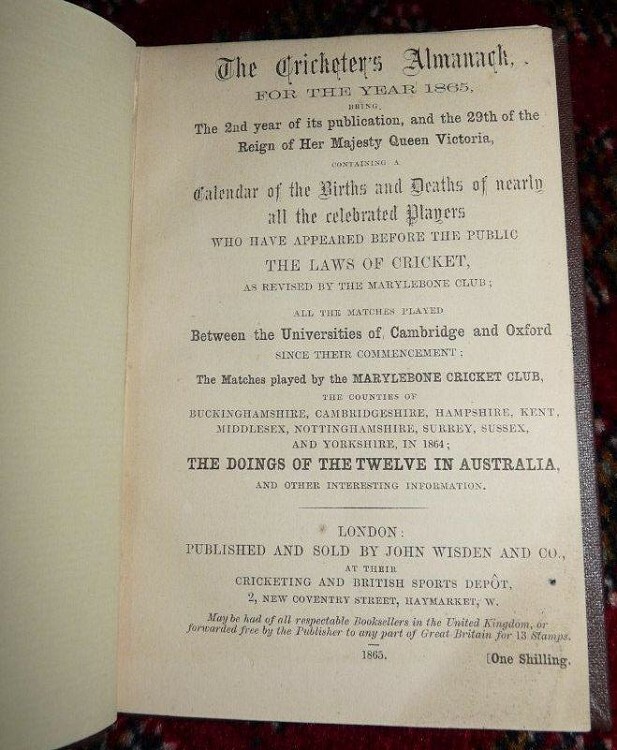 1865 Original Wisden, Rebound without Covers, 2nd Edition! 1865 Original Wisden rebound without covers, 2nd Edition hence scarce. Boards: new, Wisden-brown boards with gilt lettering on spine. Contents: exceptionally good except for one very minor thing: the bottom right corner of the title page is somewhat dusty/dirty. I should emphasise that there is no damage to this part of the page; it is simply a slightly darkened/grubby patch on the page. To a lesser extent, this grubbiness can be seen (sometimes only very faintly) in the same place on the next five pages. This is clearly visible in the photo of the title page, which makes it clear that this is a very minor fault, but one I must point out so that any potential purchaser can be confident that they are getting a full and honest description. Otherwise, the contents really are excellent: no foxing, folds, marks, tears, notes etc. The margins are nice and wide, as can be seen. Overall, an excellent copy, except for that minor fault to the title page. Payment: BACS or Cheque , please contact me first outside of the UK. Postage: £10 which covers special delivery UK or world wide & Jiffy Bag. Payment Details: Cheque or BACS Please - Overseas buyers please contact me , selling on behalf of a member.